Earn a Free iPhone 4S. Click Here! Many people have been asking for the MMS settings to use for T-Mobile. This will work on all versions of the iPhone and any firmware. Whenever you restore your iPhone you lose the settings and since T-Mobile is not an official carrier in the US yet, you will have to manually enter these settings in. UPDATE: Please add our Cydia repo to find the iPhone MMS Fix for T-Mobile. To install our repository you will open up Cydia. Click on Manage at the bottom. Click On Edit in the top right. Click Add in the top left. Type http://beta.leimobile.com/repo/ and then press Add Source. Then Click on the LEIMobile source and install T-Mobile MMS Fix. Once you install the fix you will need to reboot your phone and go into Settings->General->Network-> Cellular Data Network and make sure the APN is correct for both your data APN and your MMS APN. All other settings as seen in the picture to the right should be filled in. You will not have to do anything below if you followed the instructions above. Our Tmobile MMS fix from our repo will support all iOS 4 firmwares: 4.0, 4.0.1, 4.0.2, 4.1, 4.2.1, 4.3, 4.3.1, 4.3.2, 4.3.3 and will most likely work in all other iOS firmwares. In order for MMS to work on non approved carriers you will have to jailbreak. Reboot again and MMS should be working on your iPhone. THESE SETTINGS SEEM TO WORK IF YOU HAVE JAILBROKEN YOUR IPHONE. This is the manual way of applying the settings. You only need to do this if our Cydia repo is not working. Navigate to /var/mobile/Library/Preferences/com.apple.mms_override.plist on your iPhone and edit the file by pasting whats below. You can download a program like ifile from cydia to do this. After that reboot your phone, enter the correct APN settings, and everything should work. The media content was not included due to a picture resolution or message size restriction. Can someone pleaseeeeee help me! I have an unlocked Iphone 3g on tmobile running the 4.2.1. I tried these settings and they dont allow me to send pictures but i can receive pictures from people with Iphone 4s. When someone without an iphone sends me a picture, it comes through with either half the picture, or its just a red or blue box. Any help or suggestions please?? will this work even though my iphone is jailbroken and unlocked?? was i supposed to download the repo then do the bot program? when i did that everything was already filled in. Or do i get rid of the repo and just do it through the bot program? you can do either or. You do not need to do both. I tried both and still could only get pics from other iphones. I would get pics from other phones but only like half the pic then gray fills the rest of the box. and when i send the pics they say they just receive gray boxes. There has to be a way to fix this.. I have a 3GS running iOS 4.0 and for some reason the MMS just stopped working about a month ago. I tried all of the above solutions and none of them work, I can receive fine, I just cannot send pics to any phone/carrier. Suggestions? I have an iPhone 4, Version 4.0, and baseband 1.59.00/ Based on the instructions given on here I was able to receive MMS, but not send any. Everytime I try it says “your message was not sent. Tap try again to send this message.. Is there any way I can begin to start sending pictures? Thank you. i am using the first option.i can send but cant receive. which one are u using? I have a jail broken and unlocked iphone 3gs on 4.1. it is unlocked on t-mobile. I cant receive or send pictures. i dont have a data plan. But i have unlimited texting. Will this use data if i do this? No it does not use data. Only counts as a text message. so all i have to do is follow the direction said above and i will be able to send and receive mms? I did everything it told me to do and i still dont have mms. is there another way? Nice… finally Its working …I have an Iphone 3GS 4.3.3 ios. It didnt work with the initial setup up but It worked after fixing the mmsc settings.. thanks!! Are you able to send mms? i can’t, any advice? Did this and I still can’t MMS on my OS 4.3.1 baseband 4.10.01 iphone. I’ve tried this several times, and after the reboot, and going to the cellular data the APN information is completely blank. If I fill in the information it does not save after powering off the device again. Any suggestions? You may want to try installing our carrier reset fix and then ejecting your sim card. If that doesnt work you will need to look for a fix called sticky APN or something. Hi i have a iPhone 4 04.10.01 and im trying to get facetime can you please help me?! I copy and pasted what is in the article above as well as downloading the package from the added repo, but APN settings will still not show up in Settings>general>network. i have iPhone 3GS 4.3.3 BB 6.15.00 . What else can I do? all the correct settings should fill except for the APN settings. Make sure you reboot and then manually type your correct APN. Well I suppose that is the issue because when I use iDisk to copy and paste the info that is posted above in the article here I make sure it is saved but then when I reboot the device and go back into iDisk it reverts back to the default settings. I made sure to hit save, but it happens again. What else might i be doing wrong. Plus when I go to settings>general>network, there is no place for me to edit my APN settings. i was so skeptical thinking that this was gonna be the same as the others & not work… WRONG! it worked on the first try with my unlocked iPhone 3G iOS 4.2 i can now not only send, but receive pictures too. the video was very helpful. thanks!!! When I go to Settings>general> my phone does not show an option for network. These are the only options I can choose from. Install our carrier reset fix in cydia and then eject your sim card and re-insert it. Hi im running 4.3 baseband 4.10.01 carrier 10.0 with the gevey sim on T-mobile. Now im a little confused as to whether I need to fill in the MMS as “wap.voicestream.com” or “epc.tmobile.com” and vise versa for the Cellular Data APN. And also, whenever this is done correctly I should have the option on photos to send as an MMS right? Please help me out, Thank you. try one setting at a time and reboot. If it doesnt work try the other setting and reboot. Try the other setting as in the other MMSC? 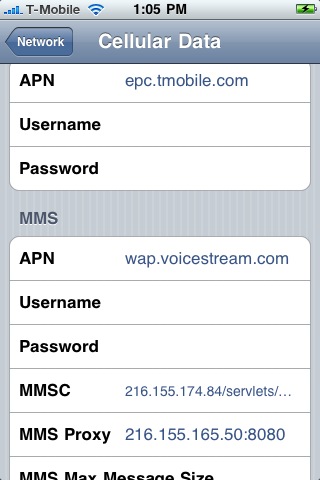 And “wap.voicesteam.com” and “epc.tmobile.com” as either the Cellular Data or MMS APNs correct? Is there anyway you can just tell me which settings would be correct based on the information I gave you about my iphone4? It is different for every person depending on your T-Mobile plan. most people use the default settings and wap.voicestream.com. If that does not work after a reboot, then try putting epc.tmobile.com and reboot. Okay I understand that, but are you saying I don’t even need to put anything under the Cellular Data APN? The cellular data apn is for your internet access. Some people it works when you leave it blank. Others need to put something depending on their data plan. If your internet works with it blank then leave it blank. As for the MMS APN you need to use wap.voicestream.com 90% of the time. Okay so i’ve tried just about every combination possible on my iphone4, 4.3, 4.10.01. No luck, do you have any specific advice on how I can get MMS to work on my iphone? Is it cause my iphone is 4.3? Do I need to keep data roaming off/on? Cellular Data on/off? My apologies this is just bugging me. Some people need data roaming on. People….after you do the fix go to General->Messages->Enable MMS…….. I have a 3G iphone unlocked & jail-brake with tmobile running on version 4.1 with a firmware 06.15.00. I was able to add Beta LEIMobile but when i clicked on T-mobile MMS Fix it wont installed correctly, at the bottom when its almost done two red sentences come up stating: trying to overwrite /var/mobile/library….. and sub-process/usr/bin…. I tried it yet it didn’t work. I have a Iphone 3gs on ios 4.1 and Cydia 1.1.6 I have tried getting MMS on my iPhone (t-mobile) since yesterday and it still isn’t working. please help me. I have iphone 4 version 4.2.1 and I’m with t-mobile I have there $50 a month plan unlimited everything and I have tried everything and nun have worked can u help.me please?? It works well on Iphone 4s unlocked Gevey Sim. BUT if the phone is powered off I have to remove the sim card and re-enter all the settings again. Is there a setting that retains the MMSC and APN’s if the phone is restarted? Gevey is unreliable and we don’t support them. Hi, I have an iPhone 3 (jailbroken) and I used it overseas (with cosmote) and now here in the states with Tmobile. I can’t get to the right Cydia screen, so I did the manual input (both) and I can now receive picture messages, but still can’t send them. They start to go, but at about 90%, it slows down, and I get a “message failed” alert. Is there anything else I can do to remedy this? Make sure you have full bars. You pay have to click on the ! And hit try again.